Prime Minister Sheikh Hasina on Monday handed over the Independence Award, the country’s highest state honour, to 12 personalities and one organisation in recognition of their remarkable contributions to the nation. 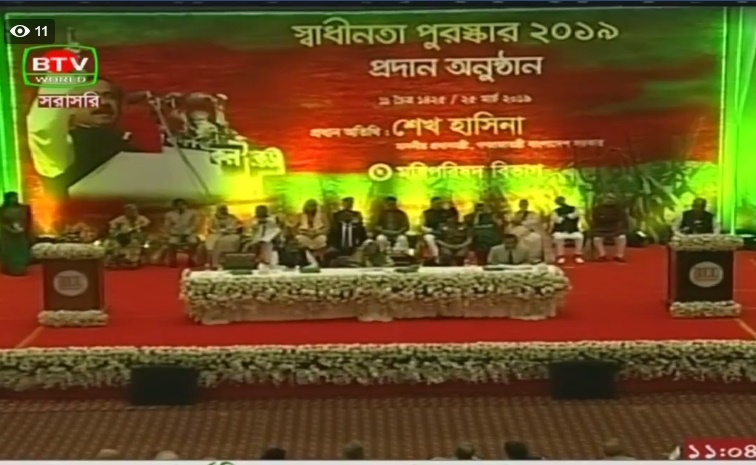 The Prime Minister handed over the awards at a function at Bangabandhu International Conference Centre. The recipients of the award in Liberation War and Independence category are martyred intellectual Mufazzal Haider Chaudhury and martyred ATM Zafar Alam, Liberation War Affairs Minister AKM Mozammel Haque and former Housing and Public Works Minister Mosharraf Hossain, Dr Kazi Misbahun Nahar, late Prof Abdul Khaleque and late Prof Mohammad Khaled. Brigadier General Dr Nurunnahar Fatema Begum received the award in Medical Science, while Dr Qazi Kholiquzzaman Ahmad in Social Service, Murtaja Bashir in Culture, Hasan Azizul Haque in Literature, Prof Dr Hasina Khan in Research and Training. The Bangladesh Atomic Research Institute received the award in Science and Technology category. Cabinet Secretary Md Shafiul Alam conducted the function and read out the citations of the Independence Award recipients with their brief life sketches.